A gentle pointing aimed at unveiling the non-dual nature of Reality and YOU! Acclaimed author on the subject of nonduality, Joan Tollifson, coined a phrase in her most recent book, “Nothing To Grasp”, which I just love. 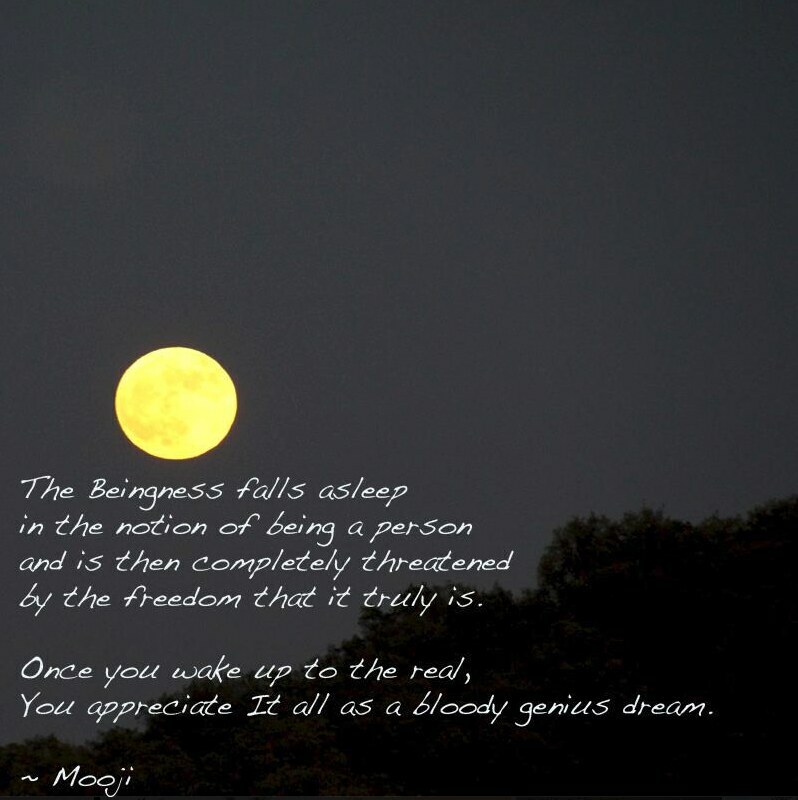 I believe it is about the most clear and helpful term that I’ve heard to describe the actual movement into the realm of enlightened awareness, and that term is “falling awake”. [Although it is not truly a movement at all, but rather just a gentle falling or dropping away of the thought-created conceptual overlay we identify as ‘our world’, which has been believed into ‘being’ by its creator and imaginary center– me.] What remains is “JUST THIS”, this inscrutable, intangible, vibrant, flowing, ever-morphing kalidescope of experience appearing magically in the eternal, timeless present NOW moment. And it appears only in and as awareness, the ‘light of consciousness’, which is always nowhere and yet everywhere, and ever-present. It is ultimately ‘what we are’, if it is helpful to express it in that way, or as ‘your original face’, as some ancient Zen Buddhist master’s have put it. It is exactly that which is breathing, thinking, living, and reading these words right here, right now. But this is a state which can neither be reached nor attained, for it is that place, NOW/HERE, which can never be lost and never be left. Indeed, there is nothing and no-one who could ever enter THIS, or leave THIS! Now, what most spiritual seekers end up doing at some point, is imagining that there is a perfect self-less state where they ought to be ALL the time, and an ordinary, everyday self-full state (i.e. ‘me’) where they are MOST of the time. In the first place, there is no-one in that self-less state they pine for, and truly, there is no-one in that self-full state either! But by believing themselves to be individuals, separate and independent of everyone and everything, they have (in their minds) fallen from grace, from ‘Eden’, and lost their souls and their true home, destined to wander endlessly through a wilderness of separation and suffering. Realizing that they (‘you’) have never left that ‘true home’ and could never do so is the ‘pathless path’, the ‘gateless gate’, and the shortest distance ‘home’ (i.e. Liberation). You just need to ‘fall awake’ to the fact that You (‘the BIG YOU’ – pure awareness itself) is expressing infinite possibilities ALL the time, and that one of those possibilities appearing NOW/HERE is an apparently separate human body-mind endorsing a belief that I am a unique ‘ME’ in ‘THIS WORLD’! …and THAT’S OK! That is just one more way in which that BIG YOU (i.e. never absent pure awareness) is showing up NOW/HERE! Sure, sometimes living this ‘life as me’ is not the most pleasant or joyful experience; sometimes it is, but sometimes it’s just plain hell. But like the weather where I live, you can just wait a little while and it will change. This opportunity to experience the full range of possibilities available in the life of a so-called human being was just the price of admission to this endlessly engaging Masquerade Ball that YOU (the BIG YOU- awareness itself) chose to pay to play. Realize that you, and I mean the really, really big YOU, have chosen to ‘be here/now’, whatever that might mean to ‘you-personally’. But there is a huge consolation to be had for the apparently-separate individual, in awakening to the appreciation of his/her ‘true, eternal, invulnerable and joyful True Self’. And from that place (the ONLY place), and forever and always THIS PLACE, I see …no problem. Lifelong student of world spirituality, the perennial philosophy, and eastern religions. Facilitator of "There Is Only God" weekly non-duality discussion group which meets in Rochester, New York, USA. For more info on meetings, click on ABOUT section. Please do not send monetary contributions. This site exists only to help support you in your journey toward higher spiritual realization. The contribution of your attention is the highest gift!